Megacorp’s marketing director Bill has a problem. His last webinar only generated one lead, and Sales are out for his blood. What can he do? Marketing executive Jen has an idea: instead of making endless boring webinars, why doesn’t Megacorp make some content that people might actually enjoy? 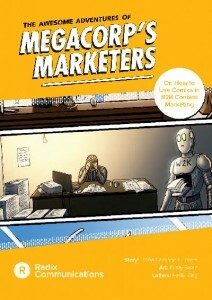 Why use comics in your marketing mix? What should your comic be about? How do you get it out into the world? We hope you enjoy reading it as much we enjoyed making it! Ready to make your own B2B comic? If our ebook inspires you to incorporate comic strips and comic books in your content marketing, we’d love to write them for you. Just say the word. And if you’d like to get more content like this from Radix, our newsletter has a monthly roundup of our thoughts, tips and gripes about copywriting in B2B tech marketing. You can sign up for it here.